Axis Vero Incorporated is committed to finding truth in every investigation. We have a long history of helping our clients find answers to their questions and in locating the evidence that others have missed. Our personal injury support team is diligent, efficient and highly skilled at getting the results that our clients are looking for. 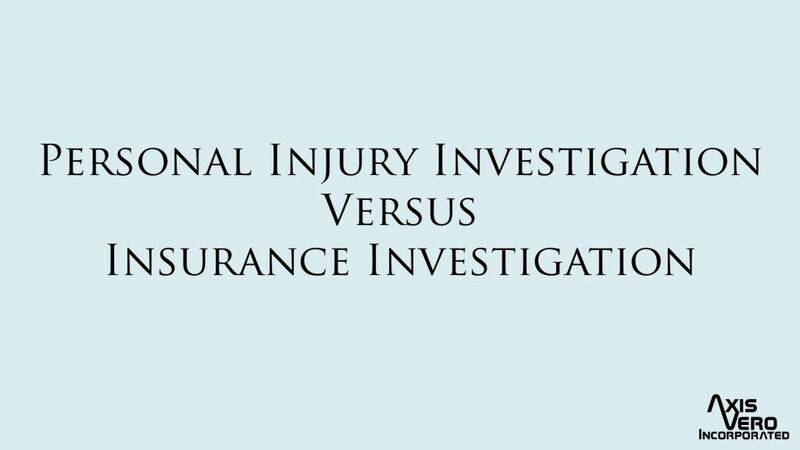 We recognize that there is a big difference between conducting an insurance investigation and conducting a personal injury investigation. While both have their merits and require diligence and accuracy in reporting, personal injury investigations require a more practical understanding of the requirements and responsibilities of the parties involved. Further to this, they require the experience and skill set to not only observe and report but also to isolate and identify facts and evidence, properly maintain that evidence, and document all of those findings in a responsible court ready format. and conducting backgrounds or historic research regarding the “at fault” party to establish their history of due diligence and response. We also review Police reports and verify the reported facts contained therein. We have found discrepancies between the original reported facts in various Police reports, which have in turn led to large settlements for our clients. We have found that in some cases even Police officers become overwhelmed in their day and in some cases have completely overlooked incident victims with less threatening or non-visible injuries because they have been heavily focused on the immediate or obvious victims of an incident.